Our new quilt, made by the Draycott ladies, is a double bed quilt, measuring approximately 92 inches. The colour palette is a beautiful range of neutrals – dark and medium greyish browns and ivory with splashes of duck egg blue. The finer details: The quilt is made up of 86 individually made 6″, 8″ and 12″ blocks. These are interspersed with 49 8-pointed stars, 24 snowballs and 120 flying geese, all bordered by another 176 flying geese. Mainly it was machine pieced, with just a little hand applique here and there. It was quilted by Yvonne Browne at Midsomer Quilting and we are very grateful for their support. This quilted throw was made by the ladies of Draycott Quilters. 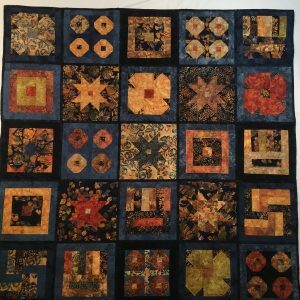 It is a reversible quilt made from beautiful batik fabrics in inky blues and glowing autumnal hues – burnt oranges, golden yellows, coppery reds. It was machine and hand pieced and quilted by hand. 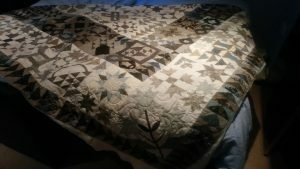 The quilt is a square of just over 60 inches. The fabric is 100% cotton, the filling 80% cotton, 20% polyester. NOTE: Bidding closed in December, 2017 and the quilt achieved a highest bid of £175. 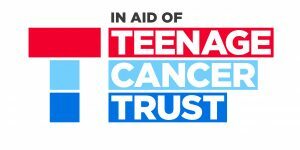 Every pound raised went to the TEENAGE CANCER TRUST helping young people with cancer. 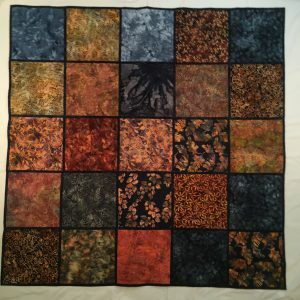 We plan to make another quilt to auction for charity. Watch this space!